Some of us require a mug of coffee at the very least each morning so that we are able to start off on the right footing at work, while others require a whole lot more than just a single mug. The thing about coffee is this – drinking it hot works best, but do make sure that you do not scald yourself in the process of drinking. 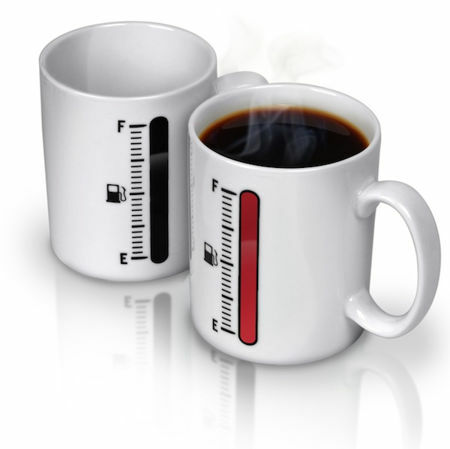 The $12.99 Tank Up Coffee Mug is fun to use, as it is your regular coffee mug with an added incentive – there is a heat sensitive gauge that actually climbs in tandem with the amount of hot water (or hot coffee) poured within. Made out of porcelain, this is one of the cooler mugs around, ensuring that you no longer run on empty each day as you head off for work.